The fishing inside the Great Smoky Mountains National Park is getting better as September is whizzing by. We had a heat wave the end of last week. Thankfully that appears to be gone and we’re starting to see temperatures drop back into high 70’s and low 80’s across the region. We have some much needed rain in the forecast each day for the next 15 days. While significant amounts of rainfall are not expected we can say without a doubt that any rain will help the fishing in a positive way! The Great Smoky Mountains National Park streams are fishing great right now. We are hitting streams from 2,500ft and above with good results. Dry fly action is absolutely on fire right now. Mid morning until late evening we’re seeing lots of Caddis and Stones that are driving fish crazy. We’re also fishing terrestrial patterns such as beetles and hoppers on the edges of fast runs with great success. Trout will slam a small beetle dead drifted in the current without much hesitation right now. 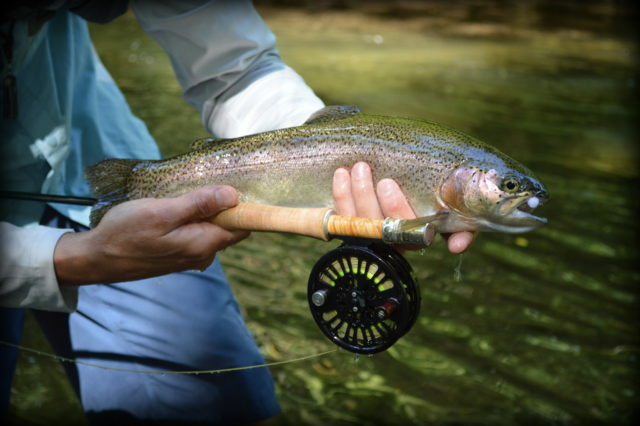 Good bets for fishing this weekend are Goshen Prong, and Lynn Camp Prong in Tennessee. Noland Creek and upper Forney Creek are tops in North Carolina. All are fishing well and seeing good hatches. The streams throughout the park are low, so stealth and presentation are key! Traffic in and around Gatlinburg and Pigeon Forge will be heavy this weekend as the Fall Rod Run comes rumbling into town. Use side roads such as Glade Road and Dolly Parton Highway to avoid the congestion. Late afternoon and evening will be the worst times to come through town from the Smokies. Have fun this week, get out and explore! We’ll see you on the water!